Kelly Paffel (www.invenoinc.com) is a recognized worldwide authority in industrial steam systems and has 41 years of experience in steam and power operations. Currently, Mr. Paffel is serving as Inveno’s Engineering Technical Manager, a United States–based international steam engineering firm with a focus on offering state-of-the-art steam system training, project management, steam system engineering and engineering assessments worldwide. Mr. Paffel is an experienced lecturer who has published many technical papers on the topics of steam system design and operation and is known for writing “Steam System Best Practices,” which is used by plants and engineers to ensure proper operation of steam and condensate systems. He can be reached at Kelly.paffel@invenoinc.com. What items in a steam/condensate system needs to be insulated? The simple answer is everything! 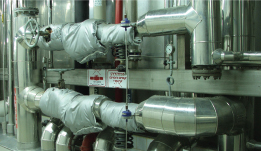 Insulating the steam lines is not sufficient to constitute an insulation-management program. The steam/condensate components include steam/condensate distribution lines, heat-transfer components, valves, condensate tanks, deaerators, flash tanks, and other items. To protect the environment by conserving energy while reducing the amount of fuel used for combustion purposes, resulting in lower emissions. A number of government agencies have addressed the safety risks of high-temperature surface areas of steam and condensate systems. All regulations clearly state that plant personnel cannot be exposed to high-temperature surface areas that can cause injury. To safeguard personnel, international standards require insulation or another protective device when the temperature of steam/condensate surfaces exceeds 140°F (60°C). In lieu of insulation, the plant can elect to install guards or other devices, though these are typically more expensive than insulation; therefore, insulation is the better approach. Steam quality is the proportion of saturated steam (vapor) in a saturated condensate liquid/steam (vapor) mixture. A steam quality of 0 indicates 100% liquid (condensate), while a steam quality of 100 indicates 100% steam. One pound of steam with 95% steam and 5% of liquid entrainment has a steam quality of 0.95. Today’s manufacturing standards and techniques in heat transfer and control are typically designed for 100% steam quality. Uninsulated steam components suffer a higher energy loss and therefore generate an increased amount of condensate; accordingly, more condensate will be entrained in the steam vapor, thus reducing the steam quality. To ensure a high quality of steam to the process, all steam components need to be insulated, which will result in higher performance in the process units. Condensate systems are prone to have carbonic acid corrosion, and the corrosion is more aggressive with condensate temperatures below 204°F. Therefore, insulating all condensate components (condensate lines, tanks, flash tanks, etc.) will keep condensate temperatures high and will reduce the effects of carbonic acid. The result is extending the life of condensate system components. Insulation plays an important role in achieving proper temperature control of a process. If the exposed outer surfaces of heat-transfer components are not insulated, they will release energy to the atmosphere instead of the process fluid. This will cause a high pressure drop in the heat transfer, which equates to a lower temperature and a high condensation rate that the system probably was not designed to evacuate. Steam tracing is a prime example of why it is important to have proper insulation. A small area of the tracing tube makes contact with the process pipe, while a large area is exposed to the atmosphere. For this reason, controlling the temperature of the tracing system becomes difficult without proper insulation. A lot of information has been developed regarding energy losses, and this article will only touch briefly on this issue. Remember, it is as important to insulate the condensate system as it is to insulate the steam system in order to prevent energy losses. To determine the proper thickness of insulation, begin by determining whether the purpose of the insulation is to prevent losses (economic reasons), to protect personnel, or both. Then, determine the appropriate surface temperature for the outer surface. Many installation conditions also affect the required thickness for insulation, including whether the insulation is indoors or outdoors, and the ambient temperatures around the steam/condensate components. A considerable amount of information is available for determining the proper amount of insulation for each application—including tools like the National Insulation Association’s/National Institute of Building Sciences’ (NIA’s/NIBS’) Mechanical Insulation Design Guide, insulation calculators, and 3E Plus® software—and plants should use these tools to make sound choices. In addition, NIA will provide justification data upon request. Steam/condensate pipe size up to 2 inches (50 DN) requires a minimum of 1.5 inches (3.8 cm) of insulation. Steam/condensate pipe size from 2 inches to 8 inches (50 DN to 200 DN) requires a minimum of 2 inches (5 cm) of insulation. Steam/condensate pipe size more than 8 inches (200 DN) requires a minimum of 3.5 inches (8.8 cm) of insulation. Plants have a number of options when it comes to insulating steam and condensate system components. Calcium silicate and mineral fiber are the most commonly used insulation types today for these components. Calcium silicate is a granular insulation that is reinforced with fibers and molded into a rigid form. Calcium silicate has a good K-value, has a service temperature up to 1200°F (649°C), and has good flexural strength. Fibrous or cellular glass is another choice available in many forms, such as pipe, flexible blanket, or rigid board. With a good K-value and a high service temperature, it is a solid choice for steam and condensate systems. Pre-insulated tubing and piping is readily available today. Plants should establish an insulation standard for the steam and condensate system and involve all personnel in the program. The efficiency and service of insulation depends directly on its protection from moisture entry, mechanical damage, and chemical damage. Choices of jacketing and finish materials are based upon the mechanical, chemical, thermal, and moisture conditions of the installation. Certainly, cost and appearance requirements are additional variables to consider. An insulation-management program is not just limited to the insulation, but also includes the overall system. Labeling the lines to indicate the product in the piping and the flow direction is essential to informing plant personnel about the system. Adding information about other items such as pressures, temperatures, and the names of the process lines is also important. Comparing the effectiveness of different insulation is done by using the K-value. The K-value (thermal conductivity) is the measurement of how much thermal energy will pass through a fixed area of a material. The lower the K-value, the higher the insulation value. K-values vary with different service temperatures. Occasionally, a U-value is used in evaluating insulation. The U-value (thermal transmittance) is simply the K-value divided by the material’s thickness. Units for K-values are expressed in Btu•in/h•ft²•°F for imperial units and W/m•°C for the International System of Units (SI). Units for the U-value are expressed in Btu/h•ft²•°F for imperial units and W/m2•°C for SI units. Steam valves should be insulated. Insulating them conserves energy and also provides personnel safety protection. Since valves require periodic maintenance, the form of insulation used on valves should be easily removable and replaceable. Many manufacturers provide custom-made insulation jackets that fit their valves. These are usually very snug fitting without voids and are very efficient. Flanges should also be insulated both for personnel protection and energy conservation. Most flanges can be insulated the same as the pipe unless the flange is periodically opened. When frequent inspection or dismantling is required, a removable and reusable covering should be used. There has been a lot of confusion regarding insulating steam traps. Steam traps require periodic testing and maintenance, which will necessitate a removable type of insulation. Removable/reusable forms are best suited for steam-trap insulation. The operation of steam traps is affected by insulation, and some steam-trap types should not be insulated. Please refer to the steam trap manufacturer’s guide for insulation recommendations. When possible, all heat exchangers should be insulated. Both fixed insulation and removable types are appropriate. If periodic cleaning disassembly is required, removable forms are preferred. If the heat exchanger is code stamped, it is important that the nameplate be raised to the height of the insulation so that it is visible. With small, pre-insulated, commercial boilers, there is usually no need to add insulation over what the manufacturer provides. However, it is important to seal any openings in the jacket, particularly on the boiler drum access locations and other exposed surfaces. Large industrial boilers are usually customized insulation projects. Ultimately, a steam system depends upon proper insulation to operate properly and to protect personnel from unsafe temperatures. Choosing the proper materials and thickness will ensure efficient operations and lengthen system life.